... unless you are trying to bow two strings! I'm not as good as I want to be at hitting just one string. Not rarely I find my place by brushing a neighboring string and making a sound that shouldn't be---not even counting whatever sounds might come out of my mouth when it happens. So I thought a little and came up with some ideas about being more precise in getting to the right string and no other. First I got in a quantitative mood and calculated that the usual layout of the strings implies that the line of the bow when centered over one string makes a 15 degree angle with the line of the bow if it were centered over a neighboring string. It's also the range of the angles that for example touch the D string without touching either the G string or the A string. That's not such a small angle---1/24 of a circle---so it ought to be doable. Then I figured I want to be able to do it without looking---to free my eyes to look at the sheet, the conductor, the metronome, the audience, flying brickbats, my left hand, or maybe the television, the chat, or the forum. In discussions with @Fiddlestix and @ratvn and maybe others, I came to understand that the player has to know how the fiddle is oriented if they are going to bring the bow to the target string. It could be done visually, but as I indicated, I'd like to avoid dependence on the eyes. I came to think that the usual main way of knowing the orientation is to feel the fiddle, partly with the left hand and jaw, but especially with the collarbone. So I came up with some exercises consistent with the above considerations. The first is simply to close the eyes and try to bow each of the strings individually, without touching a neighboring string, in random order, either 1) going directly from string to string, or 2) bringing the bow or maybe even the fiddle away from playing position between bowings. Variations would include using a specific section of the bow (near the frog, near the middle, or near the tip, for example). 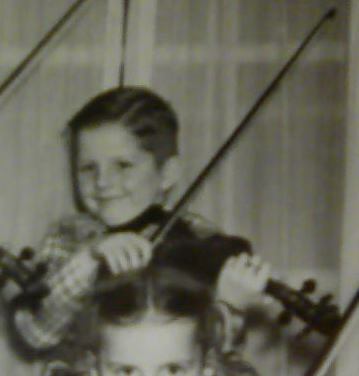 The second exercise is the same, except that the upper body is moved so that there is a change in the orientation of the fiddle to the floor. This is to extinguish the use of the surroundings as reference points to bow positions---to get awareness of the feel of the fiddle, mainly through the collarbone. I'd like to hear whether anyone uses any exercises similar to or different from these to improve skill in hitting the desired string. and whether people think the exercises have merit. I assume you've already checked your setup? If you look at the violin from the E string side, and line up the E string with the D string, you can see how high the A string is between them, same for the A and G to see how high the D string is between them. If the height isn't fairly close, then the string changes will feel less "instinctive", since the brain will be rather expecting a similar amount of change of bow angle to work right and it won't. 1mm can be a lot when you're talking about string height differences. Just saying, if it's giving you that much trouble at this stage, maybe it's the gear setup and not actually a problem with your playing. Other than that, the exercises you devised sound pretty sensible and comprehensive for addressing the problem. Yes, very standard bridge setup: 42 mm string radius, 34 mm spacing from G to E, and string heights steadily decreasing from about 4 mm on G to 2.5 mm on E, with steel strings. And yes, D is higher than its neighbors the same amount that A is higher than its neighbors. Approximately all I said was that I don't hit only the target string every time. I doubt that that is so unusual, especially given that I have concentrated mainly on the left hand for a long time, and that now I want to be able to bow without looking. So "that much trouble" is that my string selection isn't as good as I want. No offence or implication of a lack of thoroughness was intended, RU, I assure you. If it could have been attributed to some minor factor of setup that has changed, that would be the much quicker fix. My own bowing has been thrown off a bit sometimes by factors like a string starting to dig into the bridge a little, or different brands of strings being slightly different diameters, where it was enough to change the angle by a small amount. So I felt it best to ask. Play with your eyes closed. @ RosinedUp: Yep, we did discuss this situation in chat the other night. My answer remain's the same as before. About being able to walk through a dark room without bumping into wall's and furniture, it's memory. Here's another thing I don't know whether you've taken into consideration. The height of your in between strings are a given, right,,, not right, only when playing an open string is it a given. The height of the string's change as you slide up the fingerboard in the direction of the bridge. Playing open string's, the string's are relatively easy to bow cleanly, but when you start pressing down on the string's, the higher you go on the fingerboard will change the amount of string that is higher than the string on either side. If that's a clear explanation. I was checking this myself last night, the higher up the fb I went, the more precise and accurate I had to be with my bow. Another point is, it depend's how close you are playing to the bridge.If you're playing very close then your string height stay's more consistant and because of the arch of the bridge it will be easier to play each string more accurately. As @screeeech said, do it with your eyes shut. It can also help the bowing. Because you can't see where the bow is in relation to the bridge and the finger board you have to use your ears to tell / learn where it is. Thanks all, for the replies so far. @Ferret Hey, that may be the best I've heard you play that. Eyes closed seems to work for you. And I don't think I heard any stray bowing. BTW I haven't noticed before how nice your bowing action is: smooth use of elbow and wrist to stay parallel to the bridge. I chose that tune because I know it well and was less likely to make a mistake. But really, give it a try. It may help. Your arm will develop a 'memory' of where it should be. RosinedUp it encourages me that even a seasoned player like you still has the occasional two string mishap. I was beginning to think I belonged in the dunce chair! The only exercise I've done for this is watching the arm orientation as I bow, that helps me a lot. I like the exercises you came up with, think I will add them to my practice routine. It takes time to feel the angle of your arm and among the tips above, time is definitely necessary. That being said, it's amazing how fast some people pick it up and no problem what-so-ever where as others struggle with it. I think she gave a good visual demo of swinging the arm to reach the different strings. At 7:15 and 7:35 she says you shouldn't be using a sawing motion. but what she shows is nothing like sawing. Nobody saws a piece of wood the way she shows. I think actually the bow ought to be moving very much as a saw moves in its groove. Don't people think about what they are saying? She's telling people not to do exactly what they should be doing. Or so it appears to me. What gets me is when I started I tried so hard not to hit two strings at once. I finally get it right and then they tell me about double stops, playing two strings at once. I think we should start off playing double stops. This way we will be doing great on day one. Ive found that the better I know a tune, the less likely I am to hit other strings. I'm the best with tunes I can play by heart. It seems to be a matter of being confident on where the bow is going next. Conversely, I think that works for double stops, too.